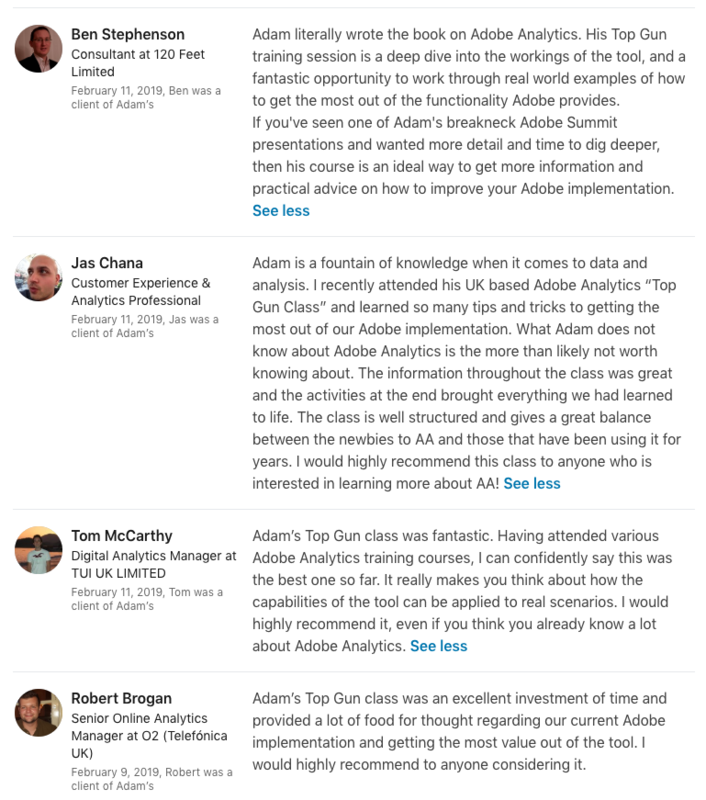 Home &gg; Blog &gg; Adobe Analytics, Featured &gg; Sydney Adobe Analytics “Top Gun” Class! March 1, 2019 UPDATE: Class is currently 30% Booked! Seats are limited! For several years, I have wanted to get back to Australia. It is one of my favorite places and I haven’t been in a LONG time. I have never offered my advanced Adobe Analytics “Top Gun” class in Australia, but this year is the year! I am conducting my Adobe Analytics “Top Gun” Class on June 26th in Sydney. This is the day before the recently announced Adobe 2019 Sydney Symposium held on June 27-28, so people who have to travel can attend both events as part of the same trip! This will probably be the only time I offer this class in the region, so I encourage you to take advantage of it! Seats are limited, so I suggest you register early! 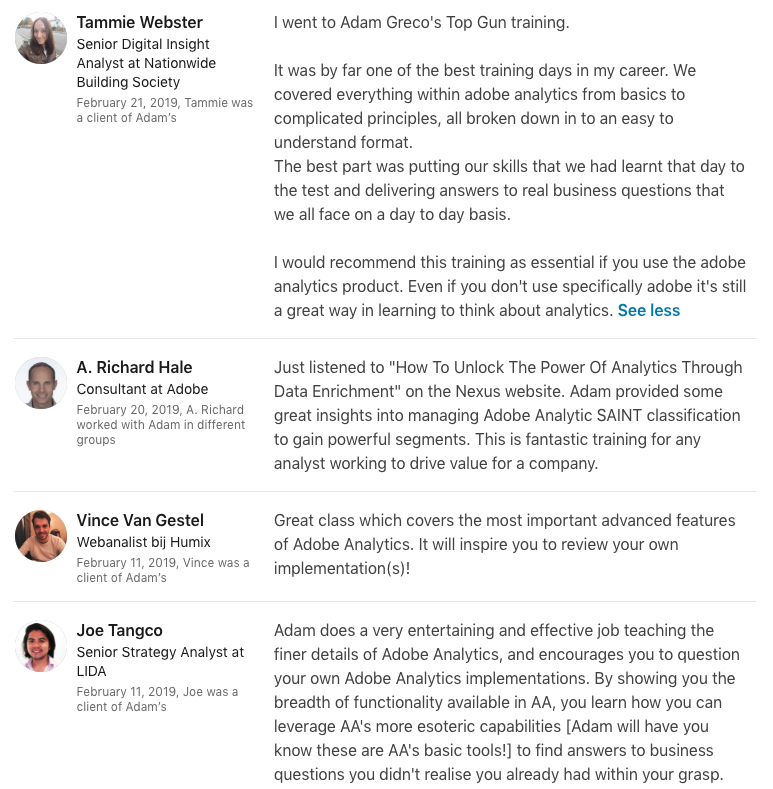 For those of you unfamiliar with my Adobe Analytics “Top Gun” class, it is a one-day crash course on how Adobe Analytics works behind the scenes based upon my Adobe Analytics book. This class is not meant for daily Adobe Analytics end-users, but rather for those who administer Adobe Analytics at their organization, analysts who do requirements gathering or developers who want to understand why they are being told to implement things in Adobe Analytics. The class goes deep into the Adobe Analytics product, exploring all of its features from variables to merchandising to importing offline metrics. The primary objective of the class is to teach participants how to translate everyday business questions into Adobe Analytics implementation steps. For example, if your boss tells you that they want to track website visitor engagement using Adobe Analytics, would you know how to do that? While the class doesn’t get into all of the coding aspects of Adobe Analytics, it will teach you which product features and functions you can bring to bear to create reports answering any question you may get from business stakeholders. It will also allow you and your developers to have a common language and understanding of the Adobe Analytics product so that you can expedite getting the data you need to answer business questions. Please e-mail me if you have any questions. Thanks!